Caring for house plants is a source of joy and pleasure for many people. For others, it's a nightmare. Learning more about the different types of houseplants and what they need to survive and thrive can give you a greener thumb. Everything from pot size to water needs to sunshine can affect the way a plant grows. House plants have different needs for light exposure. Some plants, like baby tears, crown of thorns, English ivy and jade tree thrive in rooms where there's a lot of natural light; place these by a sunny window. Others, like white flag, heart leaf rhododendron, Boston fern and Chinese evergreen thrive with very little light. These go well in interior rooms, stairwells and other areas that might not get a lot of sunlight. Other plants aren't as finicky, and do well in areas with medium exposure to sunlight, such as begonias, asparagus ferns, coralberry, grape ivy and inch plant. When you choose a house plant, keep in mind the amount of light that you have to offer and the amount of water the plant will need. If you have a hard time keeping plants watered, then you'll want one that doesn't require a lot of water, such as the Chinese jade tree. You may also want to opt for succulents or cacti. Indoor trees and hanging plants are also popular. The adventurous indoor gardener may want to nurture an orchid. In addition to specific light requirements, each variety of house plant also requires a certain amount of room for its roots to grow. Some plants, like certain fern varieties, prefer to have their roots crowded and cramped, growing greener and fuller when there's less room for their roots. Other plants are crippled by a cramped pot and fail to grow larger if they're not re-potted occasionally. Different plants have different watering requirements as well. Some need their soil to stay wet, others need their soil to stay dry for long periods between watering. Most house plants can thrive for a long time with weekly watering. Learning the specific light requirements of your plant and placing it in an area with optimal sunlight is the best way to care for your houseplants. Since house plants are generally in potting soil with a fair amount of rich compost soil, they don't need to be fertilized very often. Knowing when the plant has outgrown its pot and then repotting it properly is also important. Remove dead leaves every few weeks and wipe dust from larger leaves with warm water so they look nicer. If your house plant is droopy, leaves are yellowing or it fails to grow, then you may have a plant health problem. Failure to grow can be caused by soil mites. Mites in the soil can be killed by adding a small amount of vinegar to the water (1 teaspoon per quart), but some plants can't handle the acidity. Yellowing leaves can be caused by insufficient light or lack of water. Improving the situation may not save the dead leaves but will keep future leaves green. Droopiness is often caused by lack of water, and in most instances can be cured almost instantly just by watering. In addition to purifying the air of impurities and increasing the amount of oxygen in a room, house plants can bring psychological joy to many people. They're so important for mental health that in the Chinese system of feng shui, house plants are a required component of every room. Caring for a living thing that doesn't talk back, argue or make messes is joyful. Every time you notice new growth on your houseplant you may rejoice, and feel like a powerful part of the force of creation, knowing that your care and nurture has made a small difference in the world. What Causes Brown Tips on House Plants? 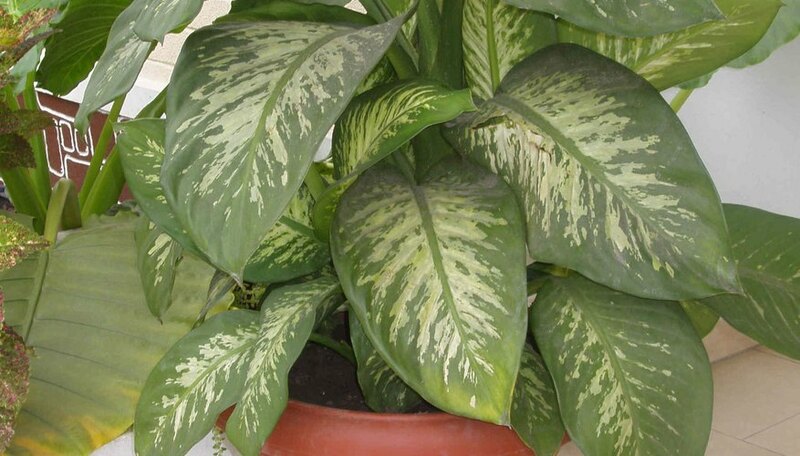 Why Do Leaves Turn Yellow on House Plants?